“I’m a Harvard grad,” a young Asian woman said while rolling a suitcase and checking her phone. No real reply from her companion, perhaps her brother, who was carrying a large flat box. “I did it,” she added. 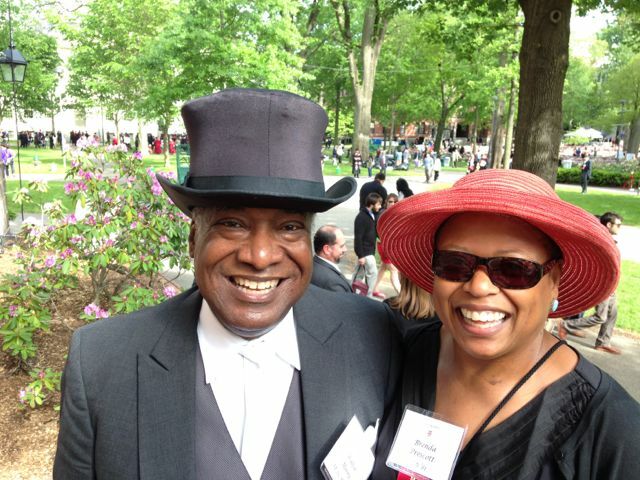 This was around 8:00 in the evening after Harvard’s 363th Commencement, and I was on my way to the pizza joint around the corner from my home after a long but joyful day serving as a marshal during the graduation ceremonies. 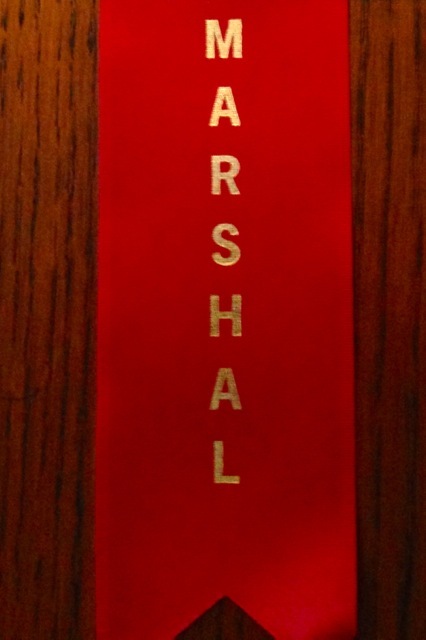 The role of marshal is largely ceremonial for alums attending their reunions. For those of us who work for Alumni Affairs and Development, the duties are largely of a hospitality/ushering nature. “Right now, we are the face of Harvard,” our leader told us. This year I was asked everything from, “Where’s my mother?” to “Where can I sit for a view of you?” The latter was said by an alum who graduated from Harvard before I was born. 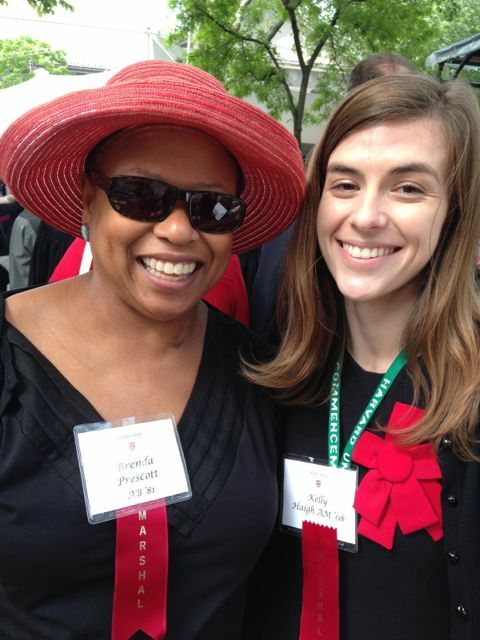 As marshals, women wear all black with a red rosette and optional hat—crimson fascinators were popular this year. Men wear top hats and morning coats, which tends to release their inner dapper gentleman of the academy. All wear a nametag with a ribbon of gold letters and a crimson ground. While I joined other marshals in herding the faculty, dignitaries, and over 6,000 grads to seats for the morning exercises, a spare black man in a slim fit suit leaned against the crowd barrier behind me. “My son, my son, my son is coming… My son is coming?” He asked me directly. “What’s his House?” The undergrads marched in according to the Houses in which they lived and studied, but not all of them would pass by us. “My son!” he pointed. He shouted to his son and asked for his hand. The son reached out and the father pulled him in for a fierce hug. The embarrassed grad escaped and after warm congratulations from me, the father asked if I taught at Harvard. No, but I do work here. “Congratulations to you,” he said. He gestured to make sure I understood his point. “It takes all of you,” he embraced a circle with his arms, “all of you to make sure that they go up.” He pointed towards the grads and then raised his palms to the sky. “Congratulations to you, also.” Oh, that filled my heart. Then my heart overflowed when Miss Aretha Franklin, on the stage to receive an honorary degree, sat at a grand piano and sang the National Anthem. During the lull in our morning duties, I ran over to Starbucks for a frappacino and a savory nosh. I shared a table with a young woman working on a laptop. We chatted, and she soon revealed that she was in town from the Bay Area because her younger sister was receiving a doctorate from the Harvard Graduate School of Education. Everyone has a story, she said. Just listen to this one. She and her sister had both been adopted, her sister joining the family after being found abandoned in a bar at the age of three months. My companion said she wasn’t a student herself, but her sister had put herself through UC San Diego, had received fellowship support for her doctoral studies at Harvard, aspired to be a superintendent of schools, and had already worked in some of the toughest schools in the Los Angeles area. How proud she was of her sister. So was I. There was also pride in the young grad’s voice who proclaimed, “I did it!” later that evening near my house. Some wonder, too. It was a moment when there was no need for her to be “Harvard humble.” I no longer wore a red ribbon or hat, but was still dressed in a black blouse and skirt. For the last time that day I turned to a new alum. “Congratulations,” I said. She beamed. This made me tear up a bit (somewhere between the Quincy House dad and Aretha Franklin). Lovely.